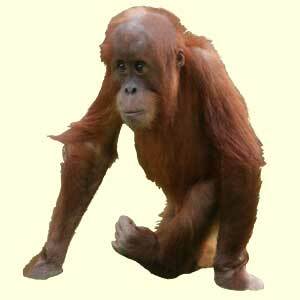 Orangutans are two species of great apes native to Indonesia and Malaysia. Anatomy, feeding, reproduction, social structure, predators, communication, evolution and all the information about orangutans. There are only two species of orangutans and they are the only two extant species of Great Apes in Asia. The sumatran orangutan is considered critically endangered and the bornean orangutan is classified as endangered by the IUCN. There is evidence that orangutans have been on earth 2 million years ago. Over the course of time they have evolved in various ways including losing the tail and being in the class of greater apes. The word orangutan means man of the forest, and the name came to be when explorers found these peculiar animals in the wild. While they had many characteristics of man, they also had differences including the amount of hair on their bodies. The early drawing of these animals that were taken back home brought about many legends and stories involving the orangutans. Today we now have pictures as well as plenty of information about how they are able to survive in the wild. Orangutans are very fun to watch with their child like antics. Of course there is much more to these wonderful creatures than just entertaining us. They are amazing in a variety of ways, and they need our help. The future for the orangutans that remain in the wild is questionable due to poaching and the depletion of their natural environment. Hopefully educating the public about their needs though will get more people on board with the conservation efforts that are in place. Orangutans are the largest animals that live in trees. Orangutans fall into the category of animals known as apes. Many people classify them wrong as monkeys. They are extremely intelligent animals and that is why so many researchers are fascinating with conducting a great deal of research about them. There are only two species of orangutans that still exist – the Sumatran and the Bornean. We need work hard to prevent a sad fate for them. One of the major differences of orangutans and gorillas is that they tend to be loners. Instead of forming troops they will be alone. The females will be with their offspring and they will pair off for mating. Other than that though you will find them on their own enjoying what is around them. They are quite interesting to watch though and that is why so many people seem to be drawn to them when they are in captivity or shown in the wild on nature programs. There are many reports out there that indicate orangutans are the most intelligent of all apes. In fact, so go as far as to say they are the most intelligent animals in the world. They definitely are able to effectively problem solve. They have been seen using tools including rocks to get to food sources. They even use large leaves to cover their heads and offer protection from the rain. Some orangutans in captivity have been taught to play computer games. While there are many orangutans in captivity that are thriving, that doesn’t take away from the severity of the problems they face in the wild. Their numbers continue to drop and both species of them are in danger of becoming extinct. It is the responsibility of everyone out there to help enforce laws and to take part in conservation efforts. That way we can enjoy these wonderful animals for many decades to come. One of the big problems is how long it takes for orangutans to reproduce. They will care for their offspring for about 7 years so the birth rate is very slow. One method to encourage it to move faster is to remove the young from the mothers soon after they are born. This is something that many find to be unethical though. Where is that balance of letting them survive as they should be nature and helping to get their numbers up? There is certainly plenty of debate on that topic that continues.